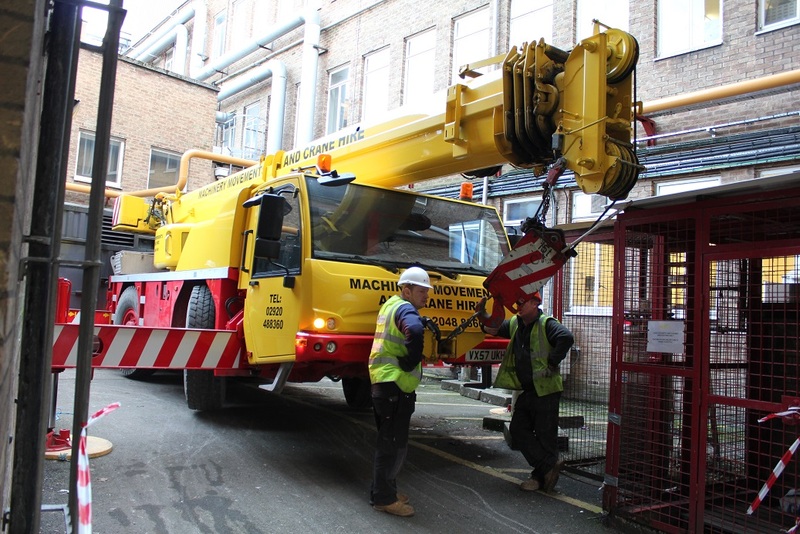 A new chiller being lowered into position with the crane. We are now halfway through the planned works on the datacentre and on the whole everything is currently going as planned. 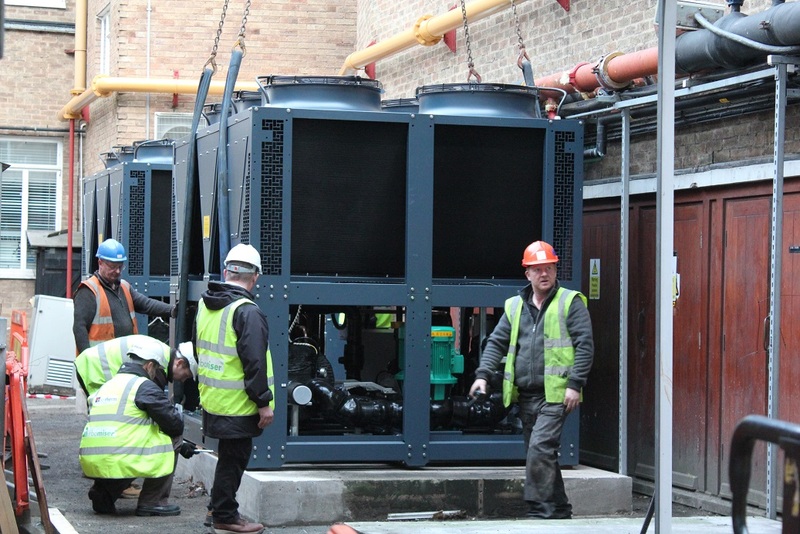 Thankfully the weather has been fairly good to work outside and the main event being the new chillers were delivered over the weekend of the 6th/7th. All talks of “weather bombs” or more technically “explosive cyclogenesis” have not currently impacted the plans. 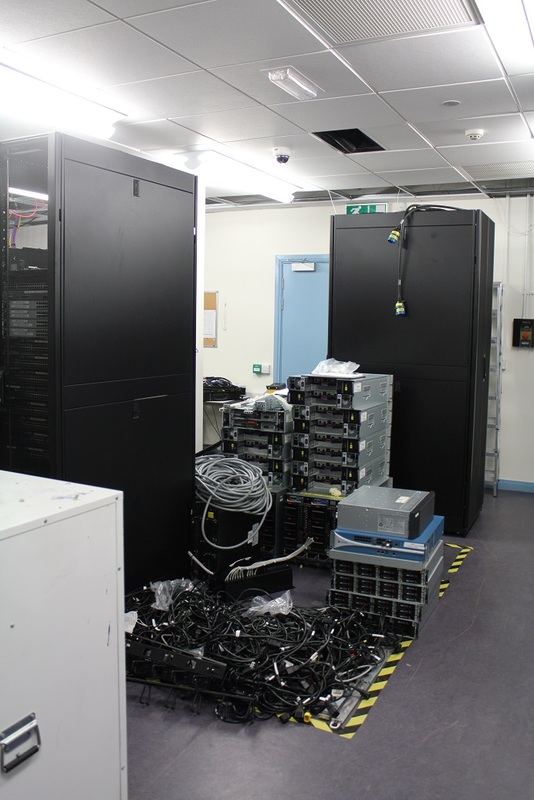 The datacentre has seen a hive of activity and over the last week we have had IT reorganising the equipment whilst the networking team have been reconnecting the equipment since the new location would require new lengths of network cable. The pipework over a “cube” which houses a set of servers was completed and fully tested whilst work on the “cube” which houses Raven is being completed this week. The new power feeds and UPS into the room has now all been fully installed. An example how re-organisation is not simple is shown below. The re-organisation of the equipment in the datacentre required some space. 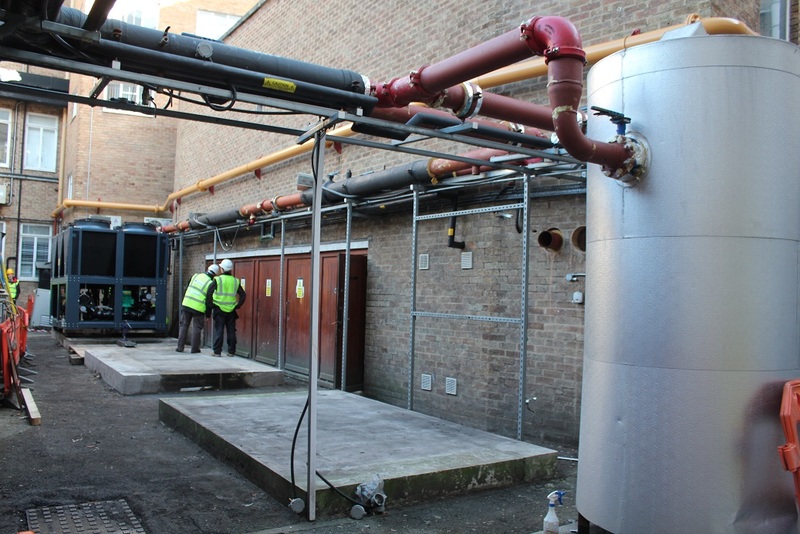 The three old chillers were taken out, with one being moved to another location in Cardiff University. The other two chillers were in quite bad shape and would probably not be possible to reuse. 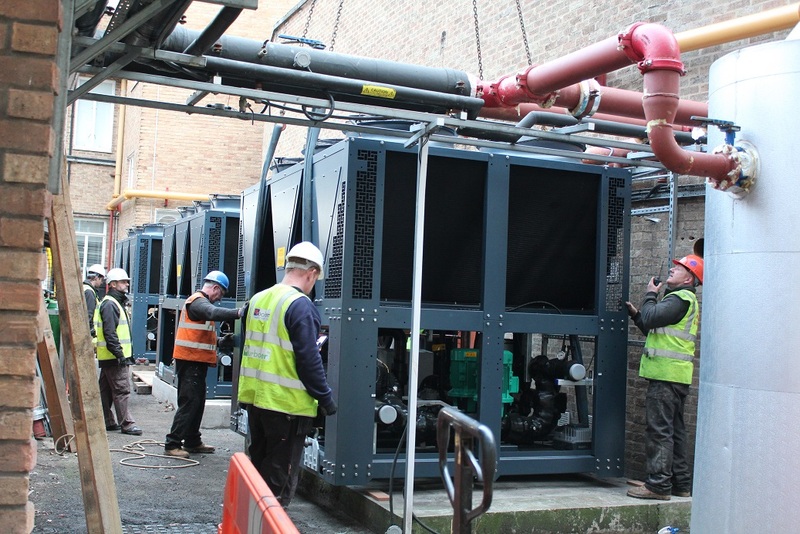 The three new chillers were delivered over the weekend of the 6th/7th (actually on St. Nicholas Day which is rather apt) and are now being connected up and installed fully this week. The deliver involved quite a few people and equipment as you can see below. Crane that was used in the chiller replacements. The first chiller was placed onto the concrete foundations. 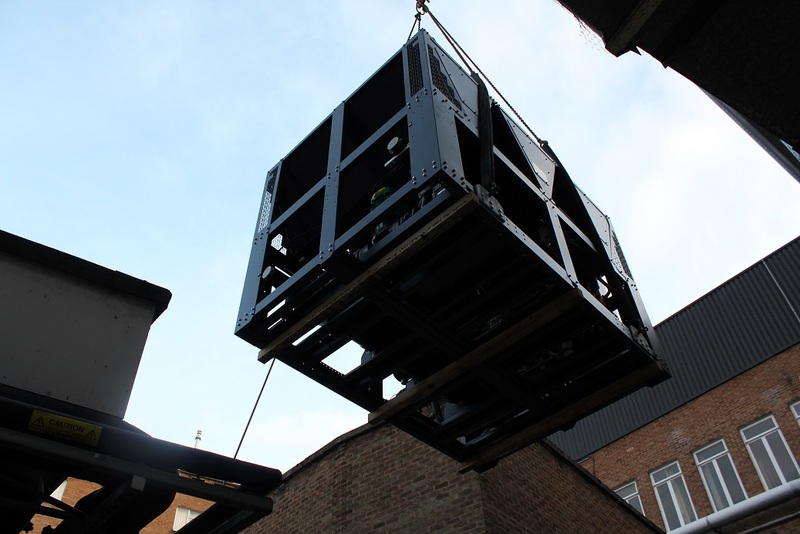 The second chiller being finally lowered into place and secured. The third new chiller being finally positioned into place. It was decided whilst the datacentre works required the systems to be switched off, that our HPC system called Raven would be updated with the most recent version of the vendors operating system and update any other equipment such as firmware updates on switches and other tidyups. The new version of the operating system will provide a new version of Lustre (version 2.5) which gives us additional benefits over the old version we had (version 2.1). The most important aspect was to allow security updates to continue due to the previous operating system coming to the end of support. The new operating system is now installed and everything is nearly in place to be handed back to ARCCA to install additional software and configuration changes. As this blog was being written Lustre was being installed – as you can imagine 175Tb of data takes a while to setup. Hopefully this post makes you aware that we are now over halfway through the planned works and no big issues have caused us to think any delays in bringing back the service will occur. This situation is always under review and further updates will be provided if this changes but hopefully the next posting about this subject will be giving a clearer indication of when we expect to be back online with our services. Keep an eye out for updates.